Alexander Graham Bell (March 3, 1847 - August 2, 1922) was an eminent scientist, inventor, engineer and innovator who is credited with inventing the first practical telephone. Bell's father, grandfather, and brother had all been associated with work on elocution and speech, and both his mother and wife were deaf, profoundly influencing Bell's life's work. His research on hearing and speech further led him to experiment with hearing devices which eventually culminated in Bell being awarded the first U.S. patent for the telephone in 1876. In retrospect, Bell considered his most famous invention an intrusion on his real work as a scientist and refused to have a telephone in his study. Many other inventions marked Bell's later life, including groundbreaking work in optical telecommunications, hydrofoils and aeronautics. 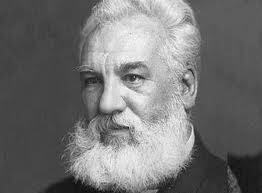 In 1888, Alexander Graham Bell became one of the founding members of the National Geographic Society.